Photo (L to R) Ms. Sangita Reddy - Executive Director Operations, Apollo Hospitals Group, Dr. Mahesh Joshi receiving certificate from Dr. Ed Glucksman, Past Vice President for CEM, Dr. Rachel Landau, Examiner for CEM. Dr. Mahesh Joshi was responsible for the development of Apollo Hyderabad Emergency Department and its EM residency training programs. He now heads all the emergency departments within Apollo Hospitals Group, numbering more than 50 in number. Dr. Joshi is also the Co-Chairman of the Society of Emergency Medicine India (SEMI). 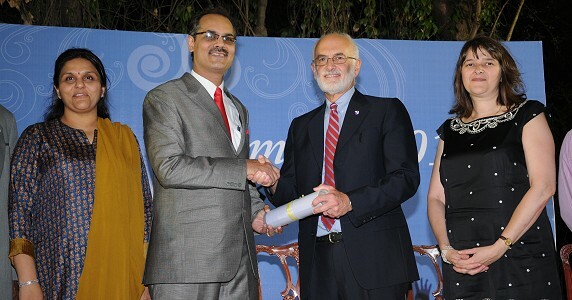 Two EM physicians also received their MCEM certificates in the same ceremony, held at Taj Banjara, Hyderabad.